For the last few years, SSLetters has been so fortunate to have a home at Catylator, a makerspace located in the World Building on Georgia Avenue in downtown Silver Spring. We've collaborated with this creative space to combine art and technology to make some truly amazing things like neon signs, screen printed swag, laser cut lettering, rubber stamps, and more. Today we're really excited to talk to Steve, the founder of Catylator, about his journey to makerhood, the role Catylator plays in the community, awesome projects he's worked on, and what's to come. Read on and join us to experience the space for yourself this summer! How did you discover that you are a maker? I have always been a maker and a tinkerer. I used to take things apart as a child to see what was inside them and how they worked. Then for many years as a design engineer I was heavily involved in research and development of leading edge sailing yachts, which was very much hands-on. We would design then test constantly to improve our work. What is the concept behind Catylator? I believe we have arrived at an incredible time with the availability of free or cheaper digital design and digital fabrication tools, but sometimes it can be hard to know just where to begin. Catylator provides that access and focuses on a foundation of hands-on education so people can feel safe taking new steps and building their creative confidence. What made you want to open your business in Silver Spring? The initiative started when I wanted to join a makerspace in Silver Spring for myself and the closest ones were Reston, VA or Crystal City, neither of which were practical to get to during the evening around here. So I had a crazy idea: why not build one here in Silver Spring? And it happened! Do you think everyone has the capacity to be creative? Yes, I believe we are all born creative beings and the research shows creativity is a skill that can be enhanced through learning and practice. Now, we may not all become the next Georgia O'Keefe, but we can all be creative in taking our ideas and bringing them to life. What would you say to someone who thinks they aren't creative but wants to be? How would you suggest they get started? I think it is important to draw parallels with other areas in your life, set expectations and to start simple. For example, after you have cooked a recipe a couple of times, you might start varying the ingredients in new ways, this is being creative. Taking a project-based class is also a good starting point so you can learn the basics, and then you can begin making simple variations, and keep practicing and exploring as you build your creative confidence. You collaborate with a lot of different groups and organizations. Can you tell us about some recent projects you've worked on? For the past year my good friend Jon Lickerman of Gravity Glass Studio has had a kiln at Catylator and we been enjoying teaching our respective after school programs and giving each group of students insight into what the other group is doing. I think it's really cool to be cross-pollinating an arts oriented group and a tech oriented group in the same space. Plus, at the end of the school year I was able to make my own glass casting, which was an awesome experience and now I have a very cool piece mounted on an LED display platform that embodies the intersection between traditional and electronic art. What is your favorite thing that you've ever made? That's a moving target! I am fascinated by light and have been exploring various sculptural forms over the years using addressable LED lights and programmable microcontrollers. In the last month I have begun protyping a wall hung light sculpture modeled on the Chinese trigram for water. The light patterns will be generative, based on cellular automata rules. You have a lot of different machines + tools for creativity at Catylator. Can you tell us about a few and how they can be used? While the laser cutter is the most popular tool in the workshop, I think the hidden gem is the vinyl cutter. This machine allows us to cut out shapes from stickyback vinyl, which has tons of applications. For a start, all the signage around Catylator was created on the machine. It really came into its own when we hosted sign making events for the Women's March, March for Science and March for our Lives. I think by now we've cranked out artwork for over two hundred professional looking protest signs! We (SSLetters) have gotten to explore the space a lot over the years, and we know you open your space to a lot of community groups and organizations. How do you see the way that Catylator fits into different communities? 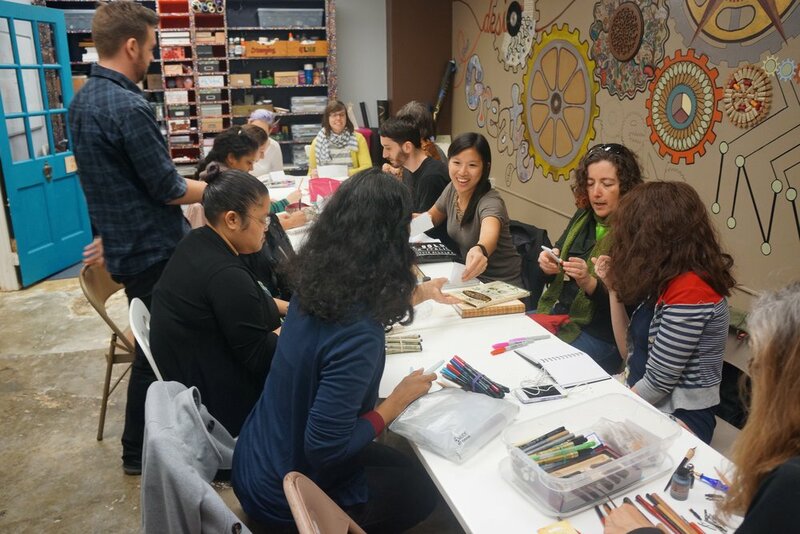 I think there is a real need for arts and technology workshops in the community, there are so many creative people who want to get together to interact and make cool things. There is merit to the idea that a professionally run space could be supported via paid workshops and classes, and then provide free or reduced fee access to groups that need it. Our libraries, schools and community colleges are not providing that function at the moment, and for private companies, as Catylator is, it has been hard to find a sustainable balance in an expensive commercial real estate environment. What's coming up for Catylator? We have a full summer camp program about to kick off on June 25 that will take us through to the end of August. However, after that the workshop will be closing and I will be evolving to build creative capacity in organizations through consulting. I recently became certified in LEGO SERIOUS PLAY, which is a toolkit that facilitates hands-on creative problem solving, strategy development and team building.